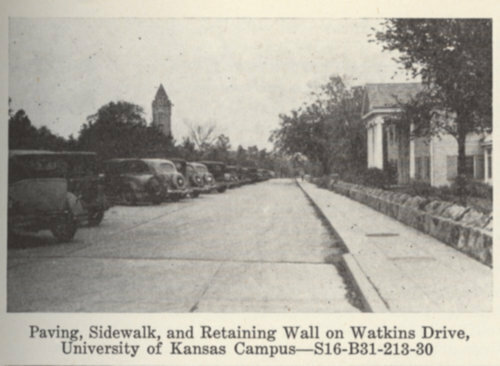 A photograph showing improvements to sidewalks and retaining walls at the University of Kansas campus performed by relief workers. This project was administered by the Kansas Emergency Relief Committee with funds from the Federal Emergency Relief Administration. During the Depression when people could not find employment, both Kansas and the Federal governments preferred the use of work relief over direct subsistence payments. The workers employed by the Kansas Emergency Relief Committee built public structures, lakes, planted shelterbelts, and made road improvements. The photograph was copied from Public Welfare Service In Kansas 1935.